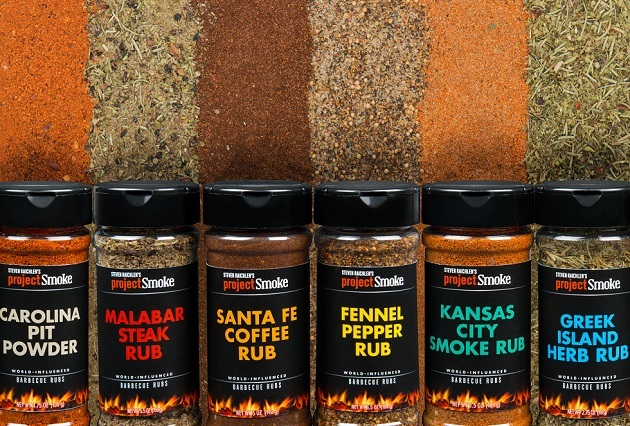 Just in time for grilling season, we proudly announce Steven’s new line of innovative spice rubs: Steven Raichlen’s Project Smoke World-Influenced Barbecue Rubs. We know that’s a mouthful, but just wait until you taste them. Inspired by regional grilling cultures here and abroad, these six unique blends debuted last month at the International Home and Housewares Show to rave reviews. Created by Steven in partnership with Camerons Products of Colorado Springs, Colorado, these vibrant and versatile rubs will bring a new and exciting palette of flavors to your table. Use in wet or dry marinades or as a seasoning before or after grilling or smoking. Here’s a preview. 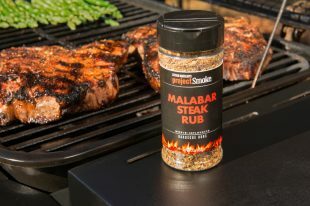 Malabar Steak Rub: Inspired by the spice markets of India’s Malabar Coast, this big flavor blend contains plenty of black pepper to stand up to any steak and fragrant herbs that pair perfectly with pork, lamb, tuna and more. Carolina Pit Powder: Carolina pulled pork demands an aromatic blend of paprika, pepper, garlic, and brown sugar. Think spice plus sweetness that goes equally well with chicken, ribs, and more. And, don’t think of grilling without it. Kansas City Smoke Rub: A soulful rub straight from America’s barbecue heartland. Flavored with real hickory smoke, it’s your go-to seasoning for poultry, pork, ribs, beef, burgers and more. Santa Fe Coffee Rub: A delectably different blend of coffee, chiles, cumin and other spices inspired by the American Southwest. Turbocharge the flavor of beef, pork, poultry, lamb, and burgers. Fennel Pepper Rub: Hot, sweet, and decisively aromatic, with roots in Central Asia and flavor that’s out of this world. Use it to electrify steaks, chops, ribs, and seafood. 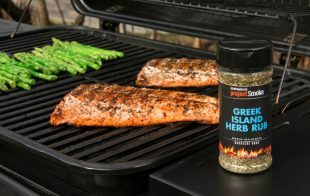 Greek Island Herb Rub: An aromatic blend of rosemary and mint that brings bold Mediterranean flavors to seafood, poultry, and meat. Strikes the perfect balance between rustic and refined. Try these ingenious rubs for yourself! Buy the set here.